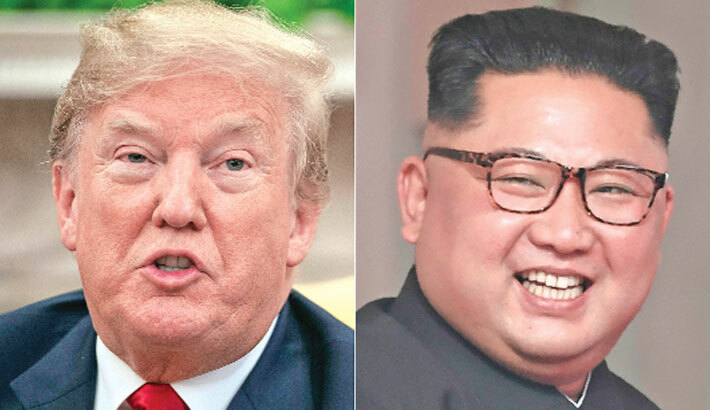 SEOUL: Donald Trump’s much-trailed announcement of a meeting with North Korean leader Kim Jong Un later this month in Vietnam sets up another box-office summit between the two mercurial leaders who were once bitter verbal enemies, reports AFP. On the heels of an intercontinental ballistic missile test by Pyongyang in November 2017, Trump derided Kim as a “sick puppy,” drawing cheers from a crowd of supporters at a campaign-style rally. A few weeks later, the International Campaign to Abolish Nuclear Weapons (ICAN) warned while accepting the Nobel Peace Prize that the bellicose rhetoric could trigger nuclear war. Kim welcomed in 2018 with a New Year address in which he warned he had a “nuclear button” on his table. Trump jumped on Twitter to declare that his was superior. The tone between the two men changed markedly over the next few months. In May, Kim released three American citizens detained in North Korea, which Trump hailed as a “positive gesture of goodwill”. Trump later said that “everyone thinks” he deserved a Nobel Peace Prize for his contributions to warming US-North Korea relations. Following their Singapore rendezvous a month later—which the pair’s matchmaker, South Korea’s President Moon Jae-in, dubbed a “miracle”—the US president said that he and the North’s leader had fallen “in love”. Even as the two sides sparred over the exact meaning of the vaguely-worded Singapore declaration, with Pyongyang accusing Washington of “gangster-like” behaviour, Trump boasted of his rapport with Kim, who he said had proclaimed his “unwavering faith” in the US president. “We will get it done together!” Trump wrote on Twitter in September.